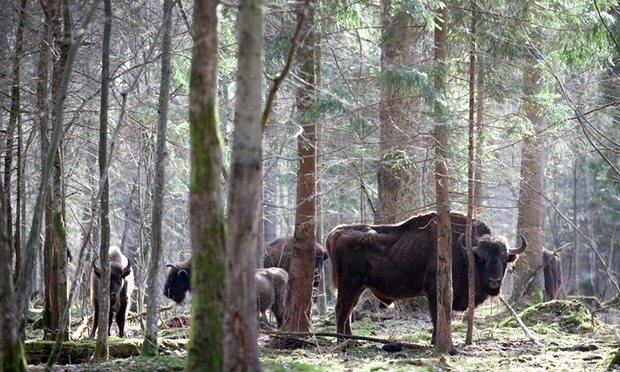 Anyone who’s ever visited this amazing primeval forest – the last such left in Europe – home to both its native bison and an amazing array of flora and fauna, knows this is a truly catastrophic decision. Along with Polish democracy, high time to save the puszcza Białowieża! Greenpeace accuses government of ignoring scientists over fate of Białowieża woodland, home to 20,000 animal species and Europe’s tallest trees. Poland has approved large-scale logging in Europe’s last primeval woodland in a bid to combat a beetle infestation despite protests from scientists, ecologists and the European Union. The action in the Białowieża forest is intended to fight the spread of the spruce bark beetle. “We’re acting to curb the degradation of important habitats, to curb the disappearance and migration of important species from this site,” the environment minister, Jan Szyszko, said. Szyszko vowed that the logging plans would not apply to strictly protected areas of the primeval forest that was designated a Unesco World Heritage site in 1979. But under the new plan, loggers will harvest more than 180,000 cubic metres (6.4m cubic feet) of wood from other areas of the forest over a decade, dwarfing previous plans to harvest 40,000 cubic metres over the same period. Vowing to protect the forest, Greenpeace accused Szyszko of “ignoring the voices of citizens and scientists, the European Commission, Unesco and conservation organisations.” Along with other environmental groups protesting the move, Greenpeace also said the logging could trigger the EU to launch punitive procedures against Poland for violating its Natura 2000 program. Fog clings to the ground behind a grove of tall birch trees silhouetted by evening light in Białowieża forest. Photograph: Raymond Gehman/CORBISSprawling across 150,000 hectares, the Białowieża forest reaches across the Polish border with Belarus, where it is entirely protected as a nature park. It is home to 20,000 animal species, including 250 types of bird and 62 species of mammals – among them Europe’s largest, the bison. Europe’s tallest trees, firs towering 50m high (164ft), and oaks and ashes of 40m, also flourish here, in an ecosystem unspoiled for more than 10 millennia.